Stores are tapping into the significant role the often-forgotten fitting room can play in purchase decisions. While 36 percent of store browsers wind up buying something, 71 percent of shoppers who try on clothes in the fitting room become buyers, according to Paco Underhill, a retail consultant. Yet the typical fitting room isn't always inviting: Only about 28 percent of shoppers even walk into the dressing room of a typical clothing chain, Underhill says. Some companies are working to change that impression. Later this year, Big Space, a technology company, plans to test a new mirror at an undisclosed clothing chain. It will recognize the gender of a customer and make recommendations based on that. Customers will also be able to request or purchase items directly from the mirror. They can even have them shipped. Earlier this year, Neiman Marcus rolled out the MemoryMirror. It is outside fitting rooms in three of its locations. They are in Walnut Creek, California; San Francisco and the Dallas suburb of Willow Bend. It is considering activating the "virtual dressing" feature. John Koryl is president of Neiman Marcus stores and online. He said the mirror allows the retailer to have specific information regarding who tried on the dress and bought it for the first time. He said shoppers must register for a unique account with their email address to use the mirror's features. Any data collected on the mirror's usage is anonymous and aggregated, he said. A division of online seller eBay that's called eBay Enterprise specializes in providing retail technology and service. It also has fitting-room technology that some stores are testing. 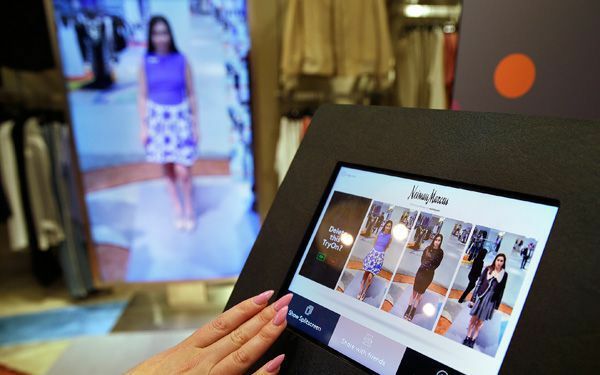 Designer Rebecca Minkoff's first two stores in New York and San Francisco are testing the new fitting room technology that uses radio frequency identification. It embeds data in clothing tags. It will be rolling out the technology when it opens stores in Chicago and Los Angeles. That will happen later this year, says CEO Uri Minkoff. Minkoff said the two stores testing this technology are selling the clothing two and a half times faster than expected. Shoppers are increasing the number of items they buy by 30 percent. "We are creating dressing room therapy," said Uri Minkoff. eBay Enterprise also is working with Nordstrom, helping the company understand how the technology performs on a larger scale. Nordstrom uses the mirrors in some fitting rooms in Seattle and in San Jose, California. But they work a little differently. Shoppers are equipped with bar code scanning devices so they're able to see what's in stock in the dressing area. "We will listen to the customer as they use the mirror and see what changes make sense to improve the experience," said Nordstrom spokesman Dan Evans. The new technology has some consumer advocates concerned. "One assumes that the mirror is not looking back at me unless you are in a fairytale," said Nuala O'Connor. She is president & CEO of nonprofit Center for Democracy & Technology. "People love new technology as long as they are aware of what is happening to them and have control of their data." But some customers are embracing it. Wendy DeWald, of San Francisco, spent $1,000 on her first trip to the Rebecca Minkoff store. She's returned a few more times. She doesn't mind sharing some of her personal data to get a better experience. This was a weird story because of the fitting rooms and about the shoppers. Who would want have high tech fitting rooms. That was also interesting.